Think of Anzhi Makhachkala and the first thing that comes to mind will probably be Samuel Eto’o; the Russian club’s marquee signing during the 2011 summer transfer window has become the poster-boy for one of the most ambitious clubs in European football. In return the iconic Cameroon striker has become the highest paid player in world football, earning a reported £350,000 per week – equating to roughly £16 million over a year. A recent television show that aired in France aimed to shine a light on the club from Dagestan – it was entitled ‘The Dream Life of Samuel Eto’o’. His decision to head east last year represented a tremendous coup for owner Suleyman Kerimov, a seal of approval for the then relative unknowns from a three-time Champions League winner. The Cameroonian’s switch away from the traditional big leagues of European football raised eyebrows across the continent with many commentators questioning the hunger of a player, who, at the age of 30, remained one of the most iconic and prolific strikers around. Cynics derided the supposedly ambitious-less Eto’o for sacrificing a glorious twilight to his career for one last mammoth pay cheque. Instead, the trajectory that Anzhi now found themselves on can serve as a fitting finale to the glittering career of one of Africa’s greatest footballing exports. No African player has matched Eto’o’s staggering medal haul across club football – neither the imperious Ivorian Didier Drogba, nor the legendary Liberian George Weah. Likewise his goalscoring record outstrips those of his continental counterparts – 280 goals in 515 appearances, two of which have come in Champions League finals. 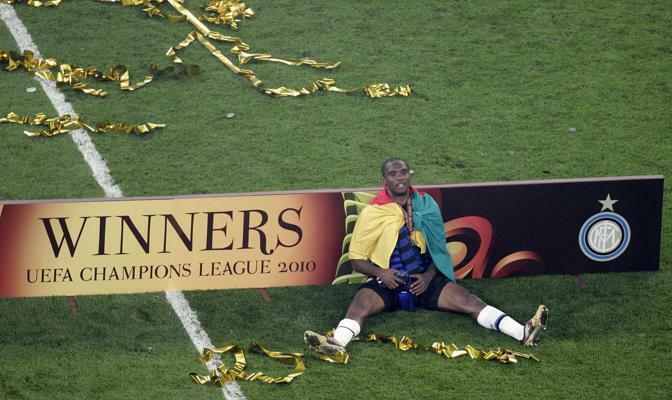 Even his record at international level is superior – though Drogba possesses a higher goals/ game ratio, Eto’o is the most decorated having claimed an Olympic gold medal in 2000 and two successive African Cup of Nations triumphs in 2000 and 2002. Given that the Cameroonian has not been surrounded by such talented players at international level as Drogba has, arguably his return of 53 goals in 109 games is greater than the Ivorian’s 58 in 89. Anzhi’s trip to Anfield for their Europa League group match represents quite possibly the most defining fixture in the club’s fledgling 21-year history. Liverpool’s proud heritage and current autarchic means juxtapose significantly with the lavish spending power of Eastern Europe’s nouveaux riches based in the politically tumultuous region of Dagestan. The fixture pits one of European football’s sleeping giants against a club with limitless ambitions and resources. Leading the line will be their four-time African Player of the Year, who is no stranger to the cauldron of noise that Anfield can become on European nights. His sole appearance at Anfield came back in 2007, where then European Champions Barcelona prevailed 1-0, but were defeated on away goals. Eto’o struggled on that occasion, marked out of the game by a player in the prime of his career; Jamie Carragher. The two are likely to face each other again on Thursday night, with one of them reaching the end of the line whilst the other is merely riding on the crest of a wave. With Anzhi currently top of the tree in the Russian Premier League, Eto’o’s journey east looks to be paying dividends. A run of 13 goals in 17 appearances so far this season suggests that the Cameroonian is rolling back the years, rekindling the form that saw him become so prolific at Barcelona and Inter Milan. Against a stuttering Liverpool defence that has conceded six goals in their two Europa League games so far this season, and was routinely dismantled by Italian veteran Antonio di Natale just a few weeks ago, Eto’o can prove the cynics and doubters wrong. This entry was posted in Previews and tagged anfield, anzhi, Anzhi Makhachkala, barcelona, europa league, inter milan, jamie carragher, liverpool, real madrid, real mallorca, russian premier league, samuel eto'o, the dream life of samuel eto'o by James Dutton. Bookmark the permalink.